Shimpo’s manual test stands offer the ability of obtaining accurate, consistent results without the high cost of a motorized system. 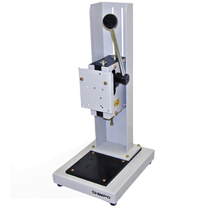 Our lever operated stands are ideal for rapid testing applications and the hand wheel stands are excellent for applications when more precise control is needed. Nearly all manufacturers’ gauges are compatible with Shimpo’s test stands for incredible versatility. Because these stands are designed for precision, balance, and durability, they are perfectly suited for measuring a limitless range of materials.